Verb tense makes me tense. ​It’s hard to explain, like trying to teach somebody how to tie their shoes. ​The explanation mostly just makes everything more complicated. If you are worried about being correct- speak simply. There is always power in that. Listen attentively- context will help you put the actions in order. That’s what tense does. Tense shows when something happens in time. Sometimes tense shows when two things are happening in time. That’s when we get tied in knots because then tense has to show when each act happens in time and when each act happens in relation to the other act. When you speak you can avoid some of the complicated aspects of tense by speaking simply and clearly. That is always a good thing. When you are listening, if someone is using tenses in a way that is confusing to you then there is probably a lot more about what they are saying that is confusing. Ask questions. Try to get them to speak more simply and clearly, there is nothing wrong with that. When you ask questions you show that you are listening and that you want to understand. When you ask questions you show the other person what you do understand already and help them to see what they as a speaker can do to make their ideas clearer. Can each be used with specific meaning in a particular context? This is round one. If you let it, it gets more complicated. This is the easy one. Easy except it describes everything BUT the present. frown emoticon“It rains” is a truth like “the sky is blue,” it just always is. Yesterday, today,tomorrow, and so we use the “simple” present. A longer sentence might go something like: I like to take walks when it rains. Then there are a bunch of different futures– future something. It will rain. & It’s going to rain. These are both the simple future tense, but there are some differences in how they are used… sometimes. It will rain tonight. = It’s going to rain tonight. One difference, even with the example above is if you do or don’t have some proof of what you are saying. so, “It’s going to rain tonight.” is supposed to suggest that you are looking at the sky and you see the clouds and the rain coming. You have a reason for thinking it’s going to rain. “It will rain tonight.” means you can’t really prove it if we get into a fight about it, but you still think you are right. This means two things will happen in the future at the same time, one of which is raining: Take an umbrella with you because it will be raining when you come home tonight. It’s raining (future)- confusing, not specific- but it tries to be. There are probably more than two kinds of people in the world, but for now- to keep what we can simple, let’s say there are two kinds of people in the world. Prescriptivists and Descriptivists. Prescriptivists talk about English as having rules, and the rules are the rules and don’t you break them. Bad human! Follow the rules. Descriptivists talk about rules and reality. There’s kinda what we are supposed to do and then there is what we really do- and let’s all play nice, and accept each other for who we are , and hold hands and…… are those flowers in your hair? Descriptivists say that more important than the rules are the ways that (educated) people actually use the language. The idea being that the rules can change as we change the way we use the language. 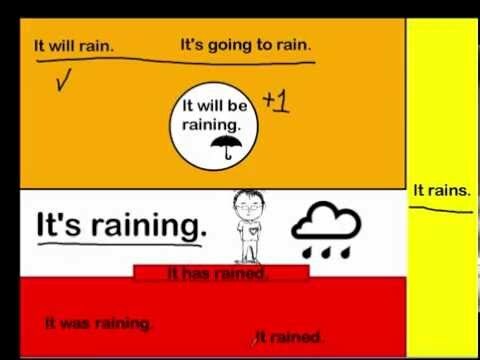 “It’s raining” with a future meaning. Prescriptivists say, “NO!” You can use this form of a verb BUT it must be part of a plan, an arrangement, or intention. It must be human. Using the present continuous for future meaning is supposed to happen as part of a plan that people have made– I am singing at your party tomorrow. It is meant to reflect the planning. Prescriptivists say NO, that is wrong because it breaks the human rule. But people are crazy and I am a descriptivist and I have ears and I say MAYBE. It doesn’t sound wrong to me– if I say it just right. If I want to fight with somebody- and win- I need more than just my ears though- I need my brain. I need to check in with lots of other native English speakers and ask them if they think it sounds right. I need to find examples of it being used this way in printed text- newspapers, novels, academic journals. If I’m lucky, the President has said it. If I can show that other people have used it and have accepted its use than I can argue and, maybe, win. Formal print sources–not Youtube comments- are best because when people write books or for newspapers and journals their writing is edited by someone else. Someone whose job is to make sure that all the writer’s English and language use are correct. I have ears, I am a descriptivist, and I am a little bit lazy… so I don’t really know if I can find examples to back up my intuition. So if you want to play it safe- never do this. But if you are feeling a little young, wild, and free get out there and express yourself!! !